Anyone who shares their life with animals knows how easy it is to fall into the habit of anthropomorphising. To the extent that some of us write dog and cat blogs on behalf of our companion animals. In a way, it’s a fun and creative way to write, and gives us chance for the most part to write humorously and post lots of cute pix. 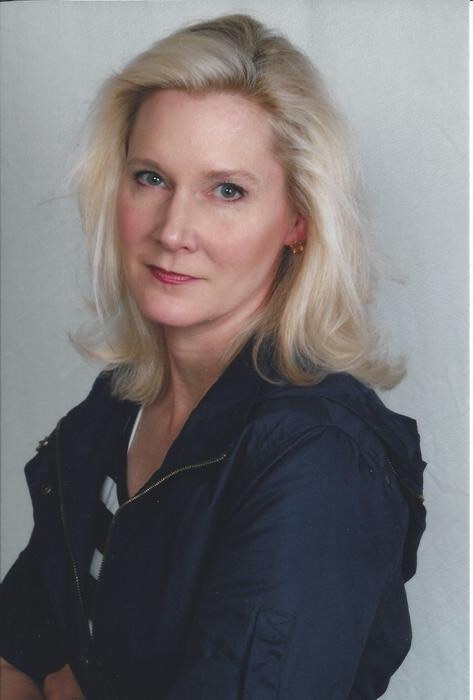 Author Kristen Heimerl has taken this one step further and produced a children’s book based on her three cats and an incident that happened one night when she and her cats noticed a suspicious looking character in their street. I’ve spent years reading dog and cat blogs, so I was interested to see how this turned out. It’s aimed at young children, so the storyline is simple. 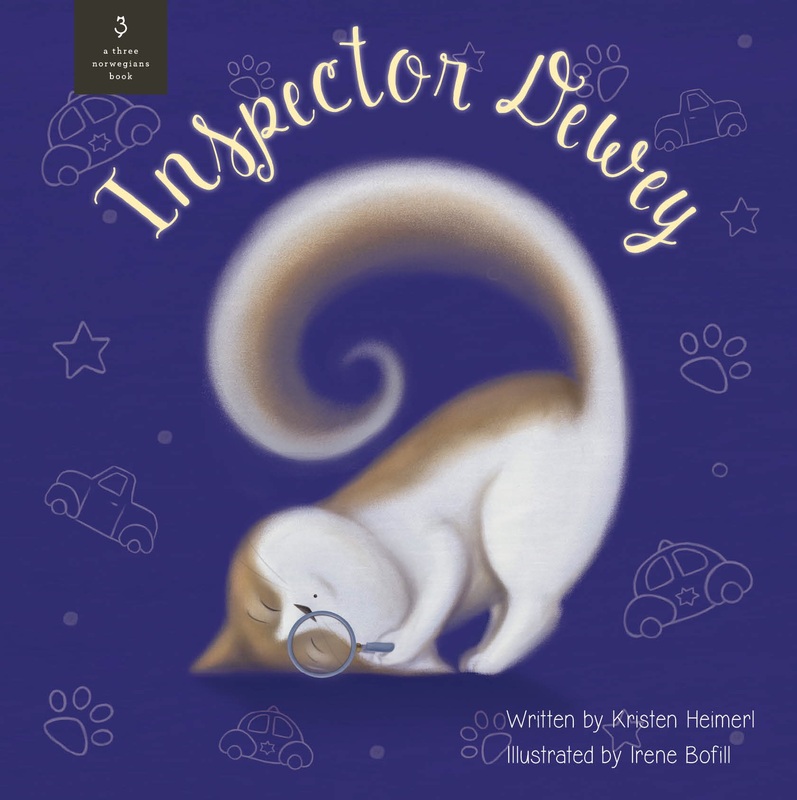 We meet the three cats, their person Anna, and the tale is told from the perspective of ‘Inspector’ Dewey. As with all books for young children, it’s very visual, lavishly illustrated throughout. I found some of the drawings a little too stylised, to the extent that some of the cats looked like fat blobs. OK so one of them is meant to be big because he eats a lot, but still, I’d have liked them to have looked a bit more catlike! But that’s just a personal preference and overall the illustrations complemented the story well. My partner thought the artwork was very good. In terms of prose, perhaps the most original and striking use of words was Dewey’s engaging way of using alliterative fishy exclamations such as ‘Great grouper!’ ‘Miserable mullet’ and ‘Holy halibut’. It would make a nice present for a young child, especially if there is one cat or more in the family. At $20 it’s not cheap – BUT – fifty per cent of the profits are going towards funding veterinary care for pets whose families are in need, so that they can stay with their families rather than go into a shelter. A commendable cause without a doubt. ‘If you love a cat, you know they’re special. ‘Many studies have shown that pets offer significant benefits to people who love them, including improved heart health, reduced stress, decreased loneliness, and increased social interaction. ‘But caring for a cat—especially a sick one—can be overwhelming when money is tight. I know this because I had to help my cat during a time of transition. Lily needed surgery to help her live a normal cat life. I stressed and struggled to scrape together the funds. Since then, I’ve realized how many owners need a little financial help to return their pet to health. ‘Sadly, during my volunteer work in shelters, I’ve seen a lot of owners leave their beloved companion behind because the financial burden became too big. ‘Our pets belong in their proper place: our home. ‘Seeing our pet suffer in poor health is distressing. Surrendering our lifelong companion to a shelter because we have fallen on tough times is truly disruptive—to us, our pets, and the shelter system. Three Norwegians currently provides funding for preventive and acute medical cat care, but would like to extend to all pets if funding becomes available. It doesn’t include chronic ongoing medical conditions. Here’s a Rafflecopter giveaway if anyone is interested. And, a story about Pippa is due to be published shortly. ‘Misery’s Mishap’ (originally written as a guest post on Pippadogblog) is going to be included along with other animal tales, and subjects such as life, family, love & romance, faith, and even the odd, inadvertent run-in with some quite unsavoury fictional characters. Caboodle is an upcoming collection of short stories, poetry and songs, by Kevin Cooper. I’ll finish with a reference to Podencos though. I originally rejoined evil Facebook for a book review group I’m in. Then I discovered there were sites offering jobs in Gib, so I scour those daily to see if I can find work for Partner. After all, he’s more in demand than I am. Inevitably I ended up looking at some Podenco groups. How many are there! Unbelievable. Podencos make up a huge proportion of dogs in rescue shelters, certainly in my part of the world. There are many rescue groups trying to find Podencos homes in Northern Europe and even the USA. In Germany they were recognised as a distinctive breed earlier this year. They are often kept chained up, starved – Spanish logic thinks this makes them better hunting dogs – and the lucky ones end up in shelters, often emaciated and near death, after one or two seasons hunting. Not all the abused ones make it, despite the care from shelters, some are just too poorly. One was thrown out by a hunter who had thoughtfully chopped off its ears first. How sick are some people. Others are shot, drowned, thrown down dry wells, or hung from trees. I’ll be the first to say Podencos are not for everyone. Snowy is probably the most affectionate dog I’ve ever had. He’s also the most demanding. When he wants to play ball, it is drop everything and play ball. If your legs aren’t in the right position on the bed, he’ll move them, so he can get comfortable curled up between them. He eats at night, presumably to fuel himself for going hunting. But although he doesn’t eat his food during the day he Does. Want. Treats. This command polite Podenco request starts with a low rumbling growl, followed by full-on barking if treats don’t appear quickly enough. If he was a person he would live on smoked salmon and fillet steak. In fact if we weren’t vegetarian, he would be living on our smoked salmon and fillet steak, because person food is Podenco food. He asks to go out. Which means he stands at the door and glares accusingly. He is an excellent guard dog. I’ve seen references to Pods being sight dogs, but most refer to their excellent senses in sight, hearing and scent. He can certainly hear Partner walking up the street, and senses cockroaches. He’s actually barked at the bathroom door and the sofa because he knows there’s one there. Not that he bothers killing them. That’s for Partner. I’m pleased Podencos are finding homes and more people are becoming aware of this amazing breed. There will never be enough homes for rescue dogs. Spanish shelters are overflowing, despite the good nature of many Spaniards who do take them in, so Podencos are transported abroad, yet shelters in the UK, for example, also have plenty of dogs. There’s no easy solution. SOSPodencoRescue – for more info and pics – is one of many, many sites. My message is the same. Please don’t buy dogs when there so many needing homes. Every dog you buy leaves, at best, a dog in a shelter, at worst, it could condemn one to death. And here, is a beautifully short video of an incredible flying Ibizan Podenco. Cat photos and Kristen’s words courtesy of Three Norwegians website, book through iRead book tours. Podencos seem to be dogs that think they’re cats. Although, to be fair, one cat I have thinks he’s a dog (he sometimes messes with shoes and he will play a cat version of fetch). Personally, I’ve never owned a dog, though one day I might get one. You’re very right about shelters. Not only does it rescue an animal that needs it, it also reduces demand for puppy mills. I call that a win-win. Snowy’s behaviour is very catlike. He’ll walk along the back of the sofa, walk all over me, lies like a cat, and actually mews sometimes if he wants something. He’s not unusual, seems to be pretty standard Pod behaviour. I’ve no idea if there are puppy mills in Spain (do they have kitty mills? never heard of any) although there are obviously breeders of pedigrees. Everyone I know gets their dogs given, or in our case, they come off the street. How is Snowy now without Pippa? Or on the same lines, save, don’t spend. Not noticeably hugely different. One thing he doesn’t do is lie under the table in the flat where Pippa use to, he has found his own safe dens – under the bed, and between the chair and the sofa where the arms overlap providing a nice roof over him. Can’t work out if he knows he’s the only guard dog now so has more responsibility but he was always protective/guarding anyway, so doubt there is little difference there. Possibly more demanding for treats? Great post, the book having some proceeds towards helping medical costs fo other feline’s is an excellent idea. I knew nothing about Podenco dogs, they are very beautiful, and by gum they can jump! “My message is the same. Please don’t buy dogs when there so many needing homes. Every dog you buy leaves, at best, a dog in a shelter, at worst, it could condemn one to death.” – 100% I’m always saying this to people who are insistent they want a specific breed of dog or cat, and are looking to buy one from a breeder. There are a myriad of breeds down the dogs home and cat sanctuary, and I defy them to walk through, past all those wee faces and leave without a four legged (or three for that matter), friend! “To those of you who continue to buy the perfect pedigree pup or kitten. You are condemning some animals to a life in a shelter, or worse, to be killed at a shelter when their time is up, or hit on the head, drowned – or – hung from a tree. Snowy is as gorgeous as he is commanding *smiles*. – sonmi sat with her rescue furry terminator dog (16.5 years and counting) upon the Cloud. John (Zande)’s book is the same, he’s putting any proceeds towards shelters in Brazil. 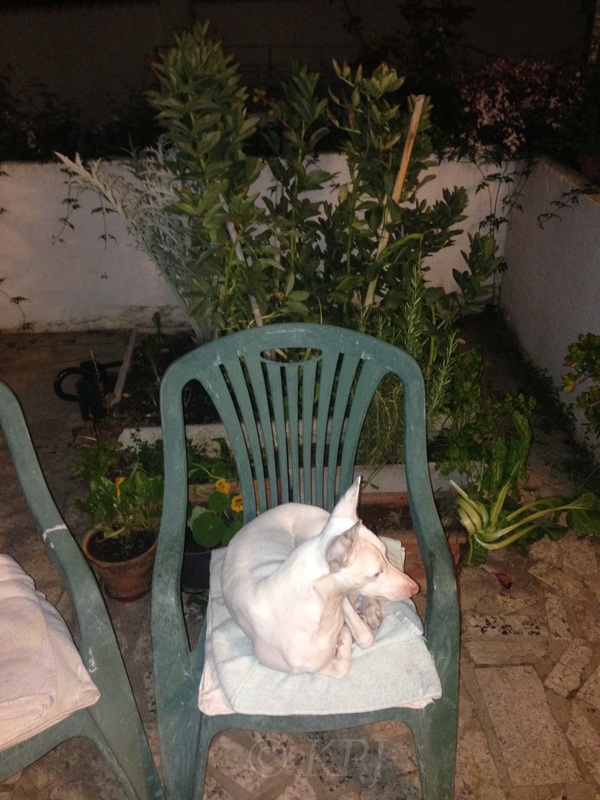 I knew nothing about Podencos either until we took baby Snowy at a few weeks to our vet Pedro, and he said, ‘Es Podenco puro y albino, muy raro’. Raro to him anyway as he’d never seen an albino one before. I got home and looked up Podencos in my trusty old Observer book of dogs, and found Portuguese ones and Ibizan ones but no Andaluces. But with the trusty internet one can find most things. Snowy’s smaller than that, his main trick is leaping onto the large three seater sofa and clearing it in one to the other arm. He used to do it in two, but has now perfected the single leap. Good on John. It’s all so heartbreaking at times. “I hope he keeps you warm on the Cloud” – She sure does *laughs*, people often think she’s a male when they see her actually. To me, she’s got such a pretty face, it seems impossible that they can get it wrong. The beholder’s eye full of love methinks. *smiles*. I like the one with the doggy chew… treat! Great coverage of podencos and pics. The one on that video looks huge… will snowy grow that large? Snowy’s a small Pod so no. Thank goodness, he’s strong and powerful enough as it is. He looks like a little power house! :D Thank goodness for small mercies and all that, hey? :D Lol. You might like this vid, and the Pods’ reaction to the result of our recent downpour after a very long, very hot, Summer. I love Pods and this left me with a big grin on my face! There are some good Pod videos and gorgeous photos on Facebook. They are such clowns and so full of life and exuberance too. Actually ours is lying on the sofa arm right now being good. For now. The power went off partway through to commemorate Gibraltar National Day for three and a half hours :D That’s great though, some of them are dancing! Amazing animals, so nimble and agile, it really shows how they love to play and have fun, thanks Totty. Puppy mills exist here in Costa Rica, but public opinion is finally forcing animal protection agencies to act and there have been recent raids. American influence begets puppy mills? At least there is public opinion, and there has been action. That’s something. It’s hard losing old dogs. Hard losing any dogs really. And a shock getting bouncy lively pups too. I’m glad we’ve got the Snows though after Pippa died, it was bad enough anyway, but we haven’t been dogless for nearly 30 years. I’m not sure about the influence….but with affluence comes status and the ‘right’ dog is required. And what people will pay for the ‘right’ dog is beyond belief. Our other dogs accepted the pups and started training them…just as well, given their now near adult size and strength! Two very affectionate creatures, but, as you say a shock having pups again. Yes it’s a shame they don’t give the astronomical sum to a shelter and take a pure breed from a shelter. I fell out with someone over their insistence about buying from a breeder, because none of the dogs in the breed specific shelters were ‘quite right’. The idea was that Pippa would train Snowy and Snowy would learn from Pippa’s gentle temperament. Pippa snapped at Snowy if he got on his nerves (still got a tiny mark in his forehead), but otherwise the only thing Snows seemed to pick up was that, ‘Cats. Are. To. Chase.’ Can’t win ’em all. House training wasn’t too much of a problem…see a sack or cardboard and perform on it seemed to be their motto – it was more the general stuff like what you can and can’t play with and whom you can and can’t disturb and when. The poodle, Black Tot and Arthur weren’t having the interlopers doing anything that they couldn’t. I don’t know how old yours were but Snows was 4/5 weeks old. It was as easy to take him out fairly often. We did make a nice den for him out of a chicken crate with nice newspaper and all he did was shred the newspaper and run out of the crate :D Puppies do sleep a lot though :) although doesn’t do a lot for productivity when they lie on you. Nowadays if these two want to lie on you you feel as if someone is inflicting peine forte et dure….they are remarkably heavy. I think small dogs are disproportionately heavy. Snowy’s head weighs a ton! I think you are right…the poodle’s head seems to weigh as much as the rest of the poodle…at least it does when lying on mine. Joints. Heads on knees and ankles/feet are incredibly heavy. Try and move said joints? Grrrrrrr! I always imagine a chorus of ‘We shall not be moved’ in those circumstances…. Cats beg to be written about. After two full cat books and one where the cat shares the lead, I still hadn’t got it out of my system and introduced a serval! Pods seem quite amazing, and I find it hard to believe that jump wasn’t faked. It is incredible! Their theme song, ‘Don’t fence me in’. Well, doing so would be an exercise in futility! Apart from cat owners, I thought it would be of interest to authors who write animal fiction too, so you came to mind there. Pods are amazing and full of surprises. Never encountered a breed like them. They also seem to be addictive as Facebook has photos of two, three, four, five and six Pod households! They must have big gardens and a lot of sofas. They are agile. I can believe it. Luckily Snowy curtails his flying leaps to the furniture not over the garden walls or gates. We’ve had a few cats through the years, but since Simba arrived – zero. LOL! They are special for sure and yes, caring for any sick animal is overwhelming and it’s sad to see them suffer. I used to help out as well at shelters, but when I started working at the veterinarian, I gave it up. I couldn’t handle the heart-break at the shelter and at work. I still can’t believe that anyone can starve or chain up any dog, much less adorable Podenco’s like Snows. Some people really doesn’t deserve to breath the same air as these beautiful dogs. Mind you, most hunting dogs are like that. Very affectionate and yes, very demanding. I think Russel and Snowy would have an awesome time together – or give the two of us lots of work. hahahaha! hahahaha @ ‘glares accusingly’. More adorable! I am also pleased to hear that. People should be made more aware of these gorgeous furries and you’re so right. Adopt – don’t shop! is also one of my motto’s. I set up a blog for Snowy ages ago as I didn’t want him taking over Pippa’s but then I didn’t write on either. In a spare moment I may resurrect Snowy’s Sitio. We’ve not had cats, Pippa the cat chasing monster wasn’t the best solution for a cat happy household, but I was sorely tempted by a stray our neighbours took in, beautiful dark brown Siamese, so elegant, and terribly cranky :D perfect fit here, and we were offered him too! I’ve never been up to volunteering at shelters, I’m just too emotional. I’d be walking round in tears all day, neither use nor ornament. We all help how we can and volunteers at shelters are invaluable. My neighbour volunteers and re homed two kittens. Now, that’s impressive. The back legs are like any similar breed, really strong and muscly. They really power off them. Thanks Sonel. Oh yes. I love watching them, especially the 3D ones. Haven’t seen Skyfall yet. Maybe because I am not crazy about Daniel Graig. In my opinion he doesn’t fit in the James Bond role. I love Siamese cats too. Russel doesn’t like cats either, just like Snowy and Simba, so I don’t think we’ll ever adopt a cat. The landlord’s cat knows he must stay clear. That is impressive. Cats are not that easy to re-home. I think so too and what fun they would have! LOL! I love those ears and yes, they truly are. No hell, who would do something like that? I would cut off their hands and everything else! It’s the same with Russel. Sharp but when he plays, he gives those tender little bites. Too adorable. hahahaha! They’ve trained us so well, haven’t they? I do like Craig. He is mean and tough, just what Bond should be. Don’t like Cruise except, interesting in Eyes Wide Shut. But I do like Kidman. Perhaps we were powerless together?! Our animals bring us such joy and demand so little. Truly, I love to see a homeless dog happy and comfortable. Yes, I thought of horses watching the vids. Animals are so interesting. So intelligent and good-natured. Don’t know what went wrong with Homo sapiens. Haha! You have made me think of a fun post. Which male film stars do you like/dislike? It would obviously exclude whoever is current these days as I have no idea of current heartthrobs! Now that does sound like fun! Do the post and I’ll name some. hahahaha! I’m thinking part poll and a bit from me, and then others can add in comments? Jean and I feel the same way about working at our local animal care centre. Mind you, of the nine dogs we have at home seven are ex-rescue dogs, along with four rescued cats and two rescued horses, so I guess we are doing our bit. Plus 50% of the net proceeds from the sale of my forthcoming book will be donated to that local care centre. I’m hoping to establish a Pharaoh fund to support those who struggle to pay vet bills. I think we all do what we can within our limitations. If I had loads of ground and loads of money … but I don’t. Nor am I tough enough to work at a shelter. But I don’t see buying my way out of it as a solution either by donating to rescues, what animals need are permanent homes, so when we can, we rehome. Each to our own. Do let me know pre pub and I’ll give you a shout. We can pick that up by email. You might well think the Podenco is the best but nothing beats our Jack Russell terrier ‘Milo’. He is the best! All our dogs are the best though. And Russells are similar being hunting rabbiting dogs. In fact I don’t have a favourite breed, I just know more, inevitably about the ones we’ve had. I’m still a bid dog fan like GSDs, Huskies, Ridgebacks, but I love the elegance of hound dogs of any type, they are beautiful to watch in action. Sounds like a nice gift book for a child. I’ve seen oodles of cat blogs, some even write in some kind of “cat language”. Some time ago, I wrote a post as a ‘Guest-blogger’ [McDuff]. Strangely enough, it became very easy to write as ‘somebody else’. That post could have gotten even longer than it was. I think it would be, but I’m unsure what age group it’s aimed at. Young is all I can work out! Yes, some of the cat and dog blogs do develop their own distinctive language. Sometimes it’s a bit tedious. Years ago, I spent far more time on Pippa’s blog than mine, over on blogger it was very popular. So I lost his dog community for the most part when I moved and ended up with a Roughseas following. It can certainly be tedious. One of them I feel I have to decipher, in order to understand what she’s saying, and it takes ages to work through. I can understand using paws in words instead of say paws, but when people use whacky language I find it a nightmare so I totally know what you mean. I haven’t visited a dog/cat blog for ages. Many of them spend more time on FB and I can do without timewasting on there. That jumper is HUGE! If I’d seen one of these dogs in the streets, I’d have assumed it was a greyhound, or something related to one. I am not aware of any Pods in this part of the world. The majority of dogs here these days are small breeds, with probably the second most common varieties being pit bulls and similar breeds. When I was a kid, we had more German Shepherds and Collies — but that was a long time ago, and I don’t remember the last time I saw one that was a pet. There is a facebook page I follow called Hope For Paws — and the owner of that page is a dog rescuer. He regularly posts videos and stories about the dogs he rescues, and includes tips on how to do this safely, as well as lots of encouragement re adopting a dog. He is in the Los Angeles area, and apparently there are a lot of dogs needing to be rescued. I have no idea whether there are as many in this part of the world, because I almost never see dogs out without an owner attached to a leash. But in the olden days we rescued (temporarily, thank God) a few dogs who had escaped from their owners. Pods are reputedly derived from North African (grey) hounds and bear a striking resemblance to the dogs depicted in Egyptian tombs, even to the Egyptian animal god Anubis. Snowy’s the smallest dog we’ve ever had, and yes, when I was a kid people had Dobermans, GSDs, collies, and we had boxers. Fashions huh? I think it’s a lovely idea too. So it’s only available to cats in America, but it’s a start, and better than nothing. I really hope it takes off. I’ve seen the Hope for Paws vids, he’s got a very high profile, and good luck to him. Snowy has settled upon his routine and knows what he wants. Who am I to say no if it’s not an issue? His body language and barking language are pretty clear :D I’m not really into authoritarianism for the sake of it, much easier to get along together. I love when you write about your dogs/dog and now Snowy is number one. He is one lucky dog and I think you and partner are lucky as well to have him as your pet. He has grown into a handsome dude for sure. Hopefully your book will be available from Amazon or somebody or the other. Really enjoyed the video of that talented jumper. An incredible dog. Thanks Yvonne. Yup, Snowy is def No 1 now. In his opinion anyway. He’s been a real help since Pippa died. It’s a blog friend’s book, but he wrote about Pippa so that will feature as one of the dog and cat stories, among many others, in there. I loved the video too. Amazing judgement for that take-off and superb clearance. Snowy and my dog Miles sound a lot alike: cute, sweet, and so so so demanding. It probably doesn’t help that I spoil Miles rotten, but he’s my baby so why not. So glad that you’re publishing something about Pippa. Your Pod sounds a bit like our Pearli, who sometimes behave a bit like a dog – scratching at the door to come in. All my / our cats have been rescues. I really don’t “get” the pure bloodline thing. Moggies and mongrels have just as much, if not more character and are generally more robust. As for anthropomorphising, well, mea culpa! It’s a friend’s book, but he wrote something about Pippa for Pippa’s dogblog last year. I can see why people prefer certain breeds except we’ve taken what’s been available, and there are always plenty of lovely dogs and cats to home. And with dog breeding, don’t know about cats, ‘breeding’ has brought with it health problems, so as you say, chances are a mongrel will be less susceptible to pure breed specific problems. Ah, I see. I hope you will share it here? I do know about puppy mills – we have them here, too. And, I think that there are some problems with cats, e.g. Persians that develop nasal/respiratory problems. I’m sure when it’s published, he’ll let me write about it and include a few excerpts. I know the dog inbreeding problems get a lot of publicity but I couldn’t see how cats could avoid similar problems, but I don’t know anything about cat showing or what’s involved. I’m more up on dogs and stupid breed ‘standards’. Great! I’m not totally au fait with either the breeding or the showing. Not sure I like the idea. I admit to being quite soft on the rescue variety! I can’t see the added value for the animals. Seems totally self-centred and vacuous. Reminds me of Miss World. And eugenics. The G.O. and I both love cat and dog anything… I can tell when we have time to watch clips as the internet data allowance gets chewed up much quicker. Anything we can do to home and keep in homes cats, dogs, domestic animals in general is a good thing. Some can’t afford the upfront costs or vet bills but can afford the time and reasonable upkeep for an otherwise homeless animal. And vice versa. Far better money to apply the money to keep animals alive and homed. And no, don’t encourage retail pet therapy. Really I’d like to see it banned because regulated has far too many loopholes. Congratulations on having your story included in Caboodle… a lovely legacy for Pippa. I don’t watch that many vids, but if there are short ones that bring a smile, why not? I share Kristen’s view that people fall on hard times that can’t be anticipated and animal care is expensive, so is insurance, so it’s nice to see an effort being made to prevent animals and their people being split up if financial hardship and health problems occur. Somehow the cat portraits look a bit like smug Husky faces. That book is priced well for a good quality children’s book and adults will like the personalities and stylized illustrations – perfect for a gift book/holiday season. Got a real laugh over the fishy quips. I may just have to have this one for myself. I’m aslo glad Pippa will be published. Such a kind soul. Snowy may be small, but he’s got the attitude. Paw waves. Rescued dogs are the best. LOL. Yes, Huskies do have smug faces. Even Pippa, though a cross like Molly’s malamute mix, had a smug look. I’m not up on pricing, although I do know children’s books are a big sector (read, the biggest) of the market. Perhaps you should buy it for RC? I’m discussing with the author about what sort of dedication as he’s suggested one. I’m thinking for all abandoned animals and the people who rescue them, but that’s early thoughts, and it’s his book in the end. Since I’ve joined the Pod groups I’m amazed at some of the agility. Saw one today where Pod leaps (standing start) onto a horse, and then goes for a ride. I’m not into agility for owner gratification, but I think for certain breeds it is stimulating and great exercise. I’m sure Little Snows would love it, although he’s created his own agility course in the flat. Perhaps I should encourage him with a little specific training rather than waiting for Crazy Ten Minutes to ensue. We reciprocate the paw waves. We even extend them to RC. The agility course groups apparently now are getting the snooty posture. Our neighbor who goes to get her 2 dogs exercise as they are home alone all day and they get crazy, said last spring her group was not allowed to participate in a big meet since they were mixed breeds (rescues) and other time the “official agility rule board” decided her dog Duncan could not officially compete for rankings/awards as he is handicapped now ( pit bulls tore off a leg) even though he had been a stellar competitor previously before the attack.She’s totally miffed.She loves Molly and is the one who keeps saying she’d love the agility courses. There’s a new one for scent hounds which she thinks Molly would excel at now – as well as the obstacles and running. WIth allt he rain, Molly and RC have also created obstacle courses in the house. Pod dogs are amazing. No doubt the breed has been in circus rings and been trick performers. I worry about agility for two reasons, one, that you’ve suggested, going the way of snooty show dog ethos, and two, potential injuries. I read on a pod group about concerns from too much twisting (not really a pod thing) or impact injuries playing flyball. Surely agility should mirror what the breed is most used to or best used to doing? In Snowy’s case it’s flying on and off the furniture. I’m not sure that all purpose agility courses suit all dogs. I really don’t know much about the different types of agility here. You would think it would be breed specific. …Molly would be great at digging and wild dashes ending up crashing into things – especially people, or bump herding. I know our neighbor keeps hers in the “recreational” type. Apparently there’s serious competition and then there’s the recreation slackers/just for fun group. Kinda like girls’ gymnastics here. Molly just yawns if you try to throw something and play catch or fetch. Her idea of good tennis ball use is as a sleep aid as she dozes watching on TV while lying on couch. Like Snowy, she loves couch leaping and open fields…still working on that suspicious water at the beach…not getting near that still. Snows is a bit of all sorts. Sofa leaps, chase the ball and catch. Oh yes! Jump on person! Even better! But for all he is powerful and strong, I would hate to push him into something unsuitable :( hey, if sofa leaps and digging suit, that’s fine by me. Could do with a few less bruises, but I’ve always bruised easily. I guess I’m not really into ‘hey snows, tricks time’. I’d rather him just be happy and find his own amusement. You have been busy with that iPad. PLAY WITH ME. NOW! A BIG thanks for taking the time to read Inspector Dewey and share your insights. A bigger thanks to opening my eyes to the Podenco. What a beautiful animal. Kristen hi, thanks for reading and commenting. I always appreciate it when an author stops by. I’m sorry I missed your schedule and didn’t get time to interview you, but I found the answers to my questions on your blog, and I particularly wanted to emphasise the financial help aspect as I think that is so admirable and wish you much success with that. I’d never heard of Podencos either before we homed one – without knowing what he was :D like most hounds, they are very elegant. I’d never heard of them either before I ended up with one unknown! I always thought it was a joke that little dogs could be so ferocious – we’d always had big dogs. And fast? Wow. I was playing touch the nose yesterday, and I couldn’t get near him. He ducks and weaves and darts and jumps so quickly, and he loves to play like that too. One minute he’s a snarling growling bunch of fur, the next he’s a curled up little cutie between my legs or with his head on my lap. I feel like the Podenco PR person. But basically, they are largely unknown outside Spain, but reading the UK groups and other Northern Europeans who gave adopted, they have totally captured hearts. Depends what you like I guess. Me, I like to give a dog a home. I’d be the classic failed foster, and although I thought I could never do it, I might consider it now. But I’d rather just rehome. In a way, I’d feel I’d let an animal down. I know fostering is a good halfway house, but I don’t like the idea of passing animals around when they need stability. Difficult world. It’s a given, isn’t it? Poor thing, how can we not? Our little one costs nothing to feed in dog biscuits although he is high maintenance in treats. We haven’t solved that one yet. Isn’t it just brill. What class. I am still looking for Snows haring around the beach. Found the vid but not the blog post! I saw a vid of pods hunting, a whole pack of them and they were WILD! Leaping about like a herd of wallabies. Found my vid. On pippadogblog (died couple years ago). This was a puppy back then. The puppy hat broke my ankle with his sheer force. Pods are not to be messed with. Have you got the link? Years ago. Gave up on the dog blog when Pippa died. I hope Snowy makes the loss easier. It’s so unfair that they don’t live as long as we do. Pippa was the classic gentle giant. 40k of gsd husky. Kids ran up and hugged him. I miss him. But life moves on. And when we take animals we need to accept that. We should adopt another dog. I don’t want time to just stop. Plenty of galgos out there. Sadly. Beryl just has a petition to sign about not sending greyhounds to Pakistan from Ireland. Is that Beryl Brennan? I’ve signed petitions of hers before. I’ve signed one about sending them to China. Absolute heartless bastards.